It is our greatest regret to inform you that Chinese New Year --- Spring Festival is around the corner. That's to say, PCBWay employees will be on leave from Jan. 30th to Feb. 11th (GMT+8). Meanwhile, we have received an official notice from DHL, Fedex and other logistics companies will suspend the delivery service from Feb. 2nd to Feb. 10th. But during this period, in order to prevent the backlog of orders in our factory, We arranged some production operators and service on duty to deal with customers' order. Therefore, if you have any problems, pls contact your service/sales representative. PS: You can still place order as usual online but all service may be slower. 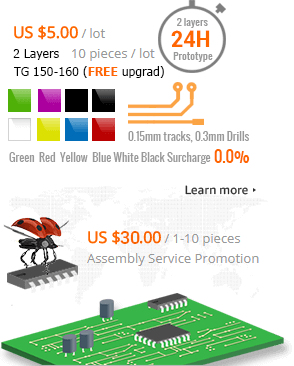 So please order your PCBs & Assembly in advance before Spring Festival in order to let your work more smooth. Please find order processing schedule before holiday as below, and adjust your order arrangement accordingly. We hope we can work more deeply in 2019, and we also hope the cooperation between our two parties will be even more fruitful. Express order is valid if pay to confirm before 18:00pm(GMT+8),Normal order is valid if pay before 18:30pm(GMT+8)!!! SMT We suggest confirm SMT order before Jan 10th if need to order components with long lead time. And even if all components are ready, SMT Orders confirmed after Jan 18th still can not be finished or delivered before holidays.